Pearl Pigment Powders Certified for Cosmetic Applications. Perfect for slime, soaps, bath bombs and general cosmetics. Approved for skin contact and meet both European and USA cosmetic requirements. 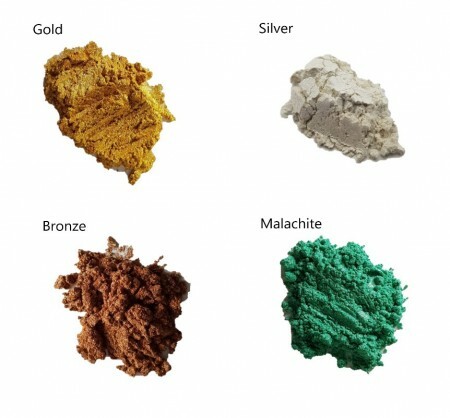 These are fine pigments based on coated natural mica and give a natural metallic appearance. They can be used in water and solvent based systems as well as in resins. Ingredients used in cosmetic products that get applied around the eye need special approval. They need to meet additional requirements not required by ingredients used in other cosmetic products. These pigments do not generate a lot of dust but care should be taken not to breathe the dust (careful handling will reduce dust generation). Use a fabric dust mask that you can buy at any hardware store. If handling larger quantities (more than normal arts and crafts requirements) then a dust extraction system is required.